Hi my name is Don and I have a problem. I am addicted to triathlons. I can’t stop, won’t stop! I starting running at a young age but I was not any good, I could just keep running longer than everyone else. So I liked it. I did my first race of any kind in 1979 it was the Marine Corps Marathon, I was 16 I didn’t know any better. My first triathlon was in 1985 in Baltimore, Maryland, I was 21. 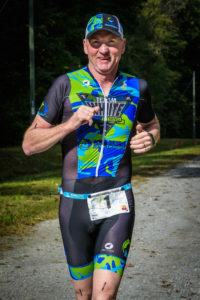 Fast forward to present day and I have done literally hundreds of triathlons and hundreds of road races. From super sprints to the Ironman in Kona. I race about 20 times a year and my favorite part is meeting new people. Now I like the sprints the best. I am at most races in the series, if you see me say hi. If you have a question about triathlons or the series please do not hesitate to ask! Train safe, have fun and be happy triathlons are FUN!